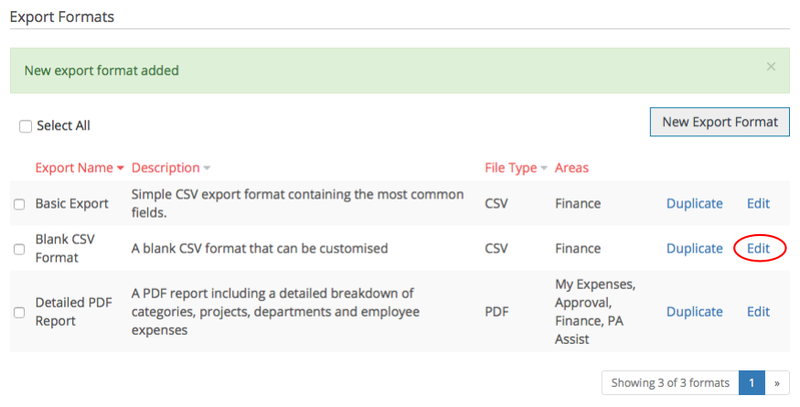 You can create your own CSV export formats which can then be used to create custom reports, view expenses in Microsoft Excel and import into additional software packages. 1. From Admin section, click Export Formats. 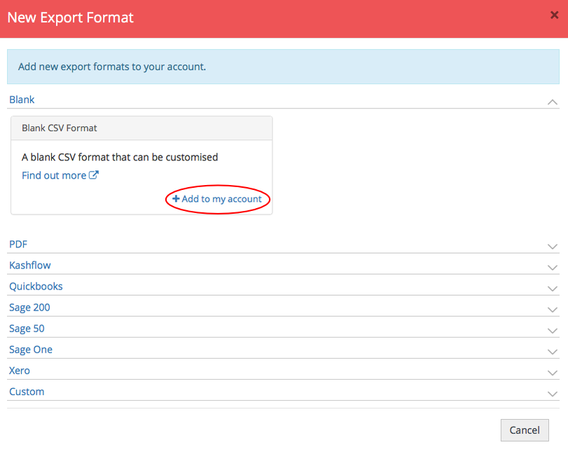 You can either add a blank format to your account or you can customise the Basic Export that has been added to your account by default. 2. Click the New Export Format button. 3. Click + Add to my account in the Blank CSV Format area. 4. The blank format will be added to your account. You should click Edit to customise your format. Change the name of the export format. Control the way the amounts are exported. Hover over the question mark icon to get more information on the different amount formats. Choose if lead zeros are to be included when opening in Excel. Choose which areas this format will be made available to. 6. Navigate to the Export Fields tab. Choose the fields that you wish to be exported when downloading expenses using this format. To add extra fields, click + Add Export Field. Data Fields - The field that you wish to be included in the export. Header name - The header name will be the default name but you can enter an alternative name here. Empty Value - Default value to show when expenses being exported do not have a value for the selected field. Field options - Certain field types allow you to choose a particular format or option. Once you are happy, click Update. Now that the CSV format has been customised, you can use this to export your expenses with.